Raymeer Bacon-El is 10 months old. He is currently undergoing treatment for unidentifiable soft tissue sarcoma at the Children’s Hospital in Philadelphia. 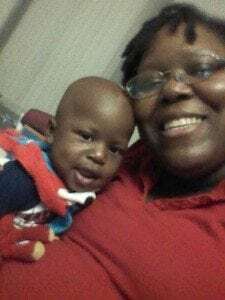 When he gets old enough, his mother, Torey Williams, wants to explain his cancer journey to him. Thankfully she has an excellent resource – a bright yellow, hospital scrubs and bandana-wearing stuffed animal called Chemo Duck. Each duck has a catheter sewn into its chest to resemble the line that is central to a chemotherapy patient’s treatment. Patients, families and health care providers across the globe use the duck as an educational tool while going through the routine therapies associated with cancer treatments. “I have shown him his duck and pointed to his broviac and then to the duck’s to show him that they both have the same thing,” said Torey. “He may be too young to understand but that’s OK. I really want to be able to explain to him when he begins asking me about why he has these scars or just about his life in general. Raymeer is expected to complete his chemotherapy treatments by the end of the year, his mother said. When he is done, she will pack Chemo Duck in a special bin that houses other mementos from his 8-month treatment regime. This entry was posted in Newsletter and tagged cancer, Chemo Duck, Chemo Duck passport, chemoduck, Chemotherapy, Children’s Hospital in Philadelphia. Bookmark the permalink.